this is my own interpretation of the retro-systems theme: The Z80-MBC2. It is a complete development "ecosystem", and using the iLoad boot mode it is possible cross-compile, load and execute on the target an Assembler or C program (using the SDCC compiler) with a single command (like in the Arduino IDE). 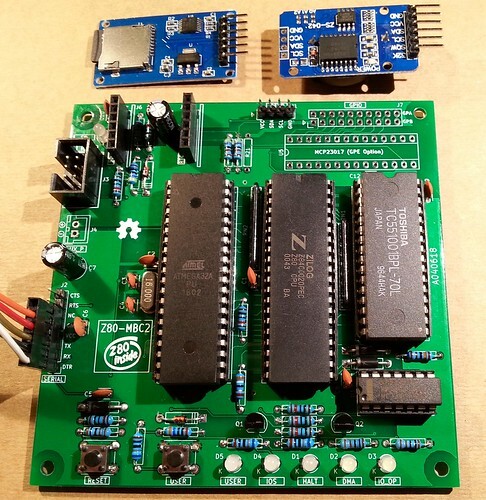 Z80-MBC2 short specs: Z80 4/8MHz (SW selectable), 128KB banked RAM, 16 GPIO, I2C, Serial, HD emulation on SD, RTC with temperature sensor, Multi-boot management for max. 10 OS (currently supported OS with 16 HD each: CP/M 2.2, Q/PM 2.71, CP/M 3), Autoboot (direct binary load and execution from SD), iLOAD (automatic load and run executables files in Intel-Hex format), SW controlled User led and key, stand-alone Basic and Forth interpreters (with IOS-LITE embedded into FW), boot mode and system parameters user menu. This thing started because some time ago an user on another forum started to ask some information for a custom made Z80 design. So, after a while I thought... Why not?